“What’s in a name?” Juliet famously asked Romeo in William Shakespeare’s heartrending play Romeo and Juliet. American policymakers, unlike Juliet, appear to have felt that names really do matter when they quietly chose a few months ago to relabel America’s “pivot” to Asia — detailed in a Defense Department document published in January 2012 — as a “rebalancing” toward Asia. Perhaps they recognized that the word “pivot” carried too many veiled connotations of a martial arts move, and thought “rebalancing” suggested a more measured American approach to Asia. After all, the US never left Asia. Whatever the nuances are to that subtle name change, there is no disguising the widespread concern that America’s new strategy toward the region may be motivated by an effort to contain a rising China. This is especially the case in the context of China’s more aggressive posture in recent years over maritime disputes in the East and South China Seas. The US rebalancing is also clearly, in part, about a redeployment of US military forces as their involvement in the conflicts in Iraq and Afghanistan winds down. 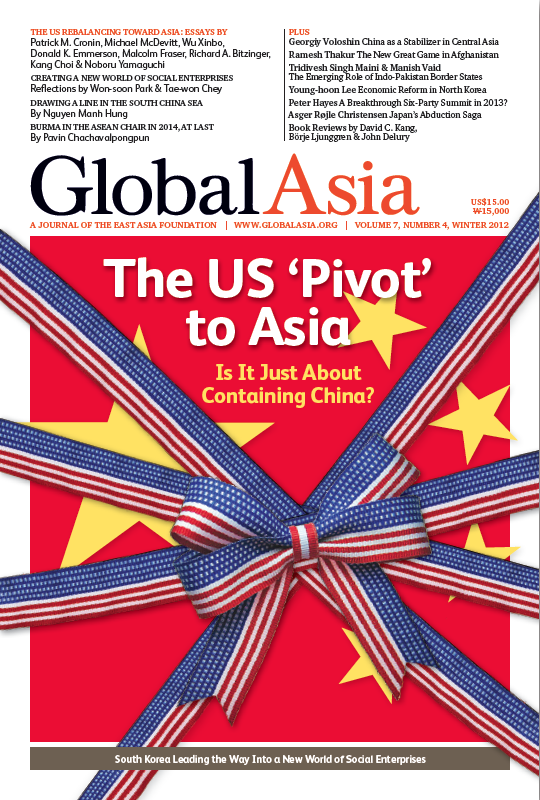 In the collection of essays in our cover package in this issue of Global Asia, we examine the implications of the new US strategy and whether it will enhance peace and security in the Asia-Pacific or harden the ongoing rivalry between the US and China for influence in the region, laying the foundations for possible armed conflict in the future. Also in this issue, we feature a pair of essays by Seoul Mayor Won-soon Park and SK Holdings Chairman and CEO Tae-won Chey on the rise of social enterprises and the possibility that this new model of economic activity will more effectively deliver social goods and services than the current ones. While the social enterprise movement is global in reach, South Korea is leading the way in Asia, as these two pieces illustrate. Elsewhere in this issue, we look again at the disputes in the South China Sea; what Burma’s leadership of ASEAN in 2014 will mean for the country and for ASEAN; China’s potential role as a stabilizer in Central Asia; the new Great Game in Afghanistan and India’s part in it; the increasing role of border states in India and Pakistan in forging reconciliation between the two countries; the possibility for economic reform and opening up in North Korea; a novel proposal for breathing new life into the Six-Party Talks to resolve the North Korean nuclear problem; and why Japan seems to be so obsessed by the issue of North Korea’s abduction of Japanese citizens decades ago, hindering better relations in Northeast Asia. As 2012 winds down and we all look ahead to 2013 and the many changes, both good and bad, that it will surely bring, all of us at Global Asia would like to wish you and your families all the best for a peaceful and prosperous New Year. Political leaders, policymakers and academics around the world have scrambled to analyze America’s strategic ‘pivot to Asia’ announced formally by US President Barack Obama in November 2011 and detailed by his defense chiefs in January 2012. Not surprisingly, friends and foes alike of US foreign policy have zeroed in on the 900-pound gorilla in the room: Is the pivot, which has in recent months conveniently been renamed a ‘rebalancing,’ really all about containing China? Will the US Pivot Trigger a New Regional Arms Race? Kang Choi examines how South Korea, as a close US ally, views the US policy and how it should be implemented. A Breakthrough Six-Party Summit in 2013? Why Not? Australian academic Hugh White's new book makes a compelling case for why the US should share power with a fast-rising China. Reviewed by David C. Kang. Is China Bound to Grind to a Halt? A new Inspector O mystery by James Church and Mao's part in the Korean War by Shen Zhihua. Reviewed by John Delury.